The Art Easel can be used as an interest center in your preschool classroom. Most of us think of painting when we think of the easel. Primarily, that has been THE favorite medium used at the easel in our classroom! However, it does not just have to be for painting with brushes! Get creative and find ways to attract the children who don't typically choose the art area during the day! You may find that it becomes the most popular area! What is an Art Easel? It is an easel where, most times, painting as a form of art is offered. However, it can be much, much more! You do not ONLY need to have paint and brushes at your easel, although that is the most popular item in my classroom (and most other preschool classrooms!). The most common items used in at the easel are paint, large or small paint brushes and paint cups. Placement of your easel should be near other active interest centers. This center typically will have two to four children using it at one time (if you have a two-sided art easel) and they do love to talk and ask questions about each others creations! This allows the children to actively participate without disturbing children who are in interest centers that require less interruption such as the Library or Computer Area. Keep in mind that paint gets EVERYWHERE: On the walls, on the floor and on the children! It is therefore best to not have this center in the flow of main traffic in your classroom so that the children walking by do not slip. If possible, place the Art Easel on a floored area, not carpet. If this is not possible, place a large mat or tablecloth underneath it. A Mess Mat is perfect for this and easy to clean. 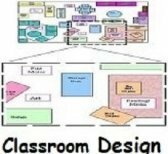 For more information about HOW and WHERE to set up Interest Learning Centers in your classroom, CLICK HERE to go to my Classroom Design article. 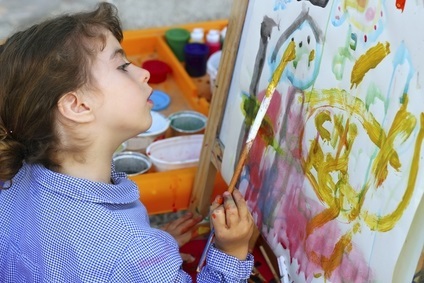 What Do Children Learn When Using the Art Easel? Learn new ways to use the various materials and tools that you provide. Build self confidence as they put their own ideas into action and make decisions as they use the materials. Develop small motor control and coordination. Learn about color, size and math as they experiment with color mixing, patterns and counting depending on the materials available. How Should the Teacher Prepare for an Art Easel Activity? As with any activity that encourages creativity, there is a no preparation needed other than planning and setting out the materials. Simply plan the items you want at the easel, place them in the easel trays and let the children explore! “That is a beautiful shade of blue! How did you make that?" "I see a pattern with the shapes you are gluing on! Triangle, circle, triangle, circle, triangle. I wonder what would come next in that pattern?" The materials to have on-hand are limited only by your imagination! Here are some basic items that are great to have around! Don’t limit yourself to just paint and brushes! Stir up the creative juices! Q-Tips or even their fingers for finger paint! We also love the brilliant colors made by using liquid watercolor! Change up the Art Easel by doing a different activity. Markers, crayons or colored pencils that are taped together! Tape stencils of shapes, animals or letters UNDER the paper for the children to do some rubbings! Provide white crayons for the children to draw on the paper with and also have slightly watered down tempera paint (or liquid watercolor paint) to "wash" (paint over) their designs with! Provide small spray bottles with slightly watered down paint. I love putting clear contact paper (sticky side out) on my easel along with collage materials. Children create and then we hang them on the window as sun catchers. Some children are more interested in pulling things off - All good, fine motor fun! Hand wipes are a great addition to the Art Easel for hands and for floor clean up! Large plastic mat to place under the table (to catch spills!). Themed materials can be added as well. 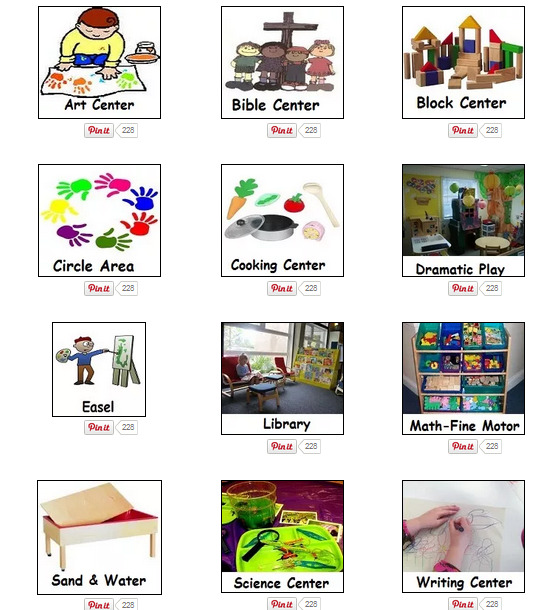 CLICK HERE to go to my Preschool Themes Page. There you can check out the Easel ideas I have listed for each theme! As noted above, open ended conversations are so important to working with children. Ask them about their creations! Ask them to tell you a story about what they are creating and write down their story. The story can be displayed on the wall or bulletin board under their creation! One resource I simply could not do with out is The Creative Curriculum by Diane Trister Dodge. I believe every classroom should have one! If your program does not have a copy, check your local library or bookstore. It is a wealth of information on interest learning centers and could not be more developmentally appropriate! You can also find the book at Amazon. Click here or the link to the right to go to their website and see what they have available. Have fun with the easel! Change things up now and again to keep the center exciting and new!